I used to stand in front of the blender so they couldn’t see. Sautéed zucchini, red and yellow peppers, spinach—I’d throw it all in there quickly with the tomato sauce and breathe a sigh of relief when the crunching would stop and the swirling would begin. Meanwhile, my boys (4 and 6 at the time) would play with their Legos on the kitchen table none the wiser. Sure, I could openly put some veggies on the table (exactly two: broccoli and carrots), but that never felt like enough. Then one day, a letter came home from my son’s kindergarten PE teacher announcing a nutrition challenge she called Strive for Five. Based on the National Cancer Institute’s recommendation to eat five servings of fruits or vegetables each day, all kindergarten classes would compete to eat at least three servings (but aim for five) of fruits or vegetables a day to celebrate National Nutrition Month in March. All the parents got a handy calendar so we could keep track. The reward? The kindergarten class with the most servings got to choose an activity for PE. That night, as my husband and I were munching on potato chips on the couch, I remembered that the letter said that the challenge might help parents eat better, too. That promise that we’d start eating a Mediterranean diet this year hadn’t really been working out. “What do you think if we all did the challenge?” I said. After my husband finished his delicate, crispy, so-salty-it-sings potato chip, he wiped his hands and said he was all for it. He reminded me that March is the beginning of Greek lent, when he cuts out meat and dairy for 40 days. If I wanted, I could join him, too. Over breakfast the next day, we told the kids that we’re all going to get in on the competition. “Even me?” said the four-year-old. “Yes, even you,” I said. “But what do we get?” my kindergartner asked. I told the boys that, just like the school reward, we could do an activity of their choice for a day. The outing could be anything they wanted, within reason, like going to the aquarium or the science museum or the arcade (read: family time). The boys grabbed some magic markers and decorated their calendars with pictures and added their names. I posted them on the fridge at eye level so they could easily mark them up every day. They boys were so excited, they wanted to start that day, but I told them they’d have to wait until March 1. While the idea seemed perfect for our family, because we’re naturally a little competitive (my husband even told the boys, “I’m going to destroy you!”), I honestly didn’t think my kids would follow through. Take our attempt at chore lists. They got tired of being asked to do a chore and mark up their magnetic chart, and I got tired of asking them. My boys were certainly acting excited about the fruit and veggie challenge, but I thought maybe at the end they’d forgo the veggies and focus only on fruit (they eat fruit like I eat chips). Or they’d give up altogether. But amazingly, they totally owned it. “Does this count as a serving?” the boys would ask me, nearly every day. Five broccoli florets, check. Four raw carrots, check. Spinach with garlic, check! Two spoonfuls of sautéed mushrooms, absolutely check! Toward the end, my kindergartner even discovered the joy of salad sprinkled generously with vinegar. The boys totally motivated us, too; my husband and I were finally eating like we were in the Mediterranean. Every time the boys marked up their chart, they grinned, as if they were getting away with something. Little did they know I thought I was getting away with something, too. It may have worked because they could take care of their own chart. Or maybe they had the arcade in mind, but I also think they had a chance to outshine their parents every day. When do kids get to do that? When my kindergartner was tallying up his servings for the day, he’d also count up everyone else’s. “Ha! I have… 7 and Daddy has only 5!” Every week or so, he’d add up everyone’s total servings for the month so far, just to see who was pulling ahead (math skills!). My little one, I must admit, fell off the wagon toward the end. In the last week, he started saying “I don’t care if I win,” with chocolate on his cheek. But my kindergartner cared very much, and during the month he started reading nutrition labels on almost everything we ate (“Mom, this orange juice is good for you. It has no sodium!” he even said to me). On the last day, my kindergartner and my husband were neck and neck. “You’re totally going down!” my husband said to him at breakfast. After our boy left the room, I whispered to my husband that maybe we could let him win, just this once. “He’s come so far, and he totally deserves it,” I said. He just smiled at me. At the arcade, our boys shot up dinosaurs as my husband and I sipped on our coffee, thinking we were totally owning this parenting thing. My kindergartner’s class won the competition at school, too. Mostly, my kids’ good eating habits stuck around after March. They do eat more veggies than they did before the challenge, but I’m not above mashing sweet potato into pancake batter. This article was written by Cheryl Pappas from Real Simple and was legally licensed through the NewsCred publisher network. Please direct all licensing questions to legal@newscred.com. 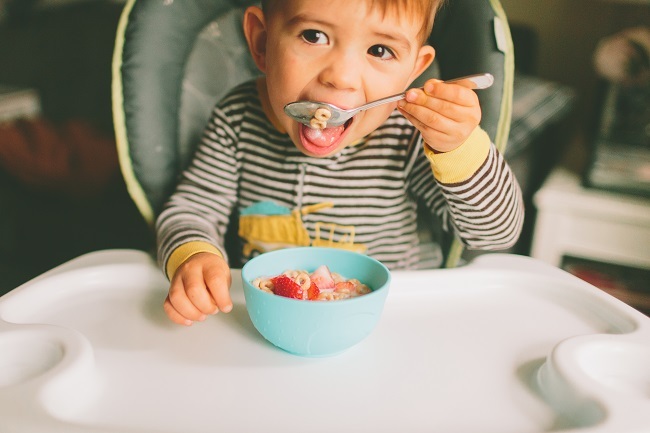 When children start learning to feed themselves, they can become picky about the foods they will try out. 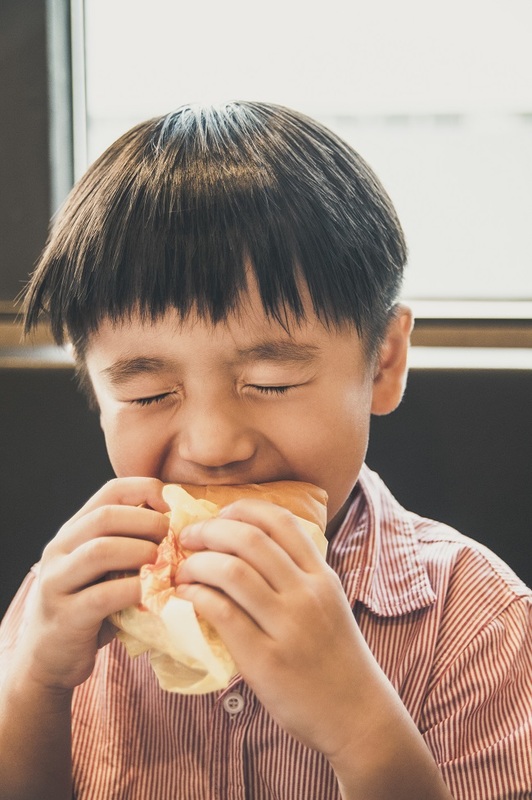 Here are a few ways to encourage picky eaters to try new foods. Have your children assist with cooking easy dishes; they will be more likely to eat it if they helped create it. Keep meal and snack times consistent. If your children eat a snack at the same time every day, they will get used to being hungry for dinner around the same time every day. Cook a variety of foods regularly. This way your children become accustomed to seeing new foods and trying them out will become a routine. Finally, be a role model. Your children will be more enticed to try new foods if they see you doing it. What are some ways you encourage your little ones to try new foods? Spruce up snack time with this easy, healthy and fun snack! Dunk the carrots into the hummus or dip. Then put some goldfish crackers on a plate and use the carrot stick to “catch” the crackers. In a hurry? This sweet green juice has lots of vitamins and makes a good pre-practice dinner or a great breakfast. Use a blender or juicer to combine the ingredients into a quick, healthy meal. If your children have a strong aversion to anything green, you can use more strawberries or raspberries or add some blueberries. If your children love macaroni and cheese, try this new twist on one of their favorite meals. Use your family’s favorite types of milk and cheese to tailor this to their liking. This makes about 12 muffins. Preheat the oven to 350°F. Grease a 12-cup muffin pan with butter or spray it with a butter spray, then dust it with flour, tapping out the excess flour. Cook macaroni according to package directions. Drain the pasta, saving one cup of the cooking water for later. In a saucepan, melt the butter and stir in the flour. Stir constantly until the mixture is lightly browned. Slowly add the milk and raise the heat to bring the sauce to a boil. Reduce the heat and allow the sauce to simmer and thicken for about three minutes. Add the cheeses, salt and pepper to the sauce mixture and stir it until it is smooth. Remove the sauce from the heat and add the macaroni. Stir it until the cheese sauce coats all the noodles. Cover the mixture to keep it warm. For the topping, combine the melted butter, bread crumbs and Parmesan cheese. Fill each muffin cup with the macaroni mixture, and then sprinkle each with the topping. Bake the muffins for about 15 minutes or until the tops are golden brown. Let the muffin pan cool completely, and then refrigerate the whole pan for up to 24 hours. When you are ready to serve your macaroni muffins, just reheat them in a 350 °F oven or the microwave. For added nutrition, you can add some ground flax seed, chopped broccoli or finely sliced carrots. You can serve this simple dinner recipe with a side salad or mixed vegetables. Open the container of croissant rolls and separate them. Layer each croissant with a slice of ham or turkey and your cheese of choice. Roll up the croissants and bake them as instructed on the packaging. These also make great after-school snacks and easy lunches. If you have a picky eater on your hands, one great way to entice little ones to try new foods is to make eating them fun! Try turning everyday foods into shapes and animals, such as slicing a bagel and arranging it on a plate to look like a slithering snake or using cookie cutters to cut sandwiches into hearts, stars or dinosaurs. Shrink family-size recipes into personal-size versions. Children will feel special having their very own bite-size pizza. Make a face! Use fruit and veggies to spruce up a boring sandwich with eyes, ears and a mouth. Let your child help you prepare the meal. If they have a hand in making it, they’ll be more inspired to taste it. Encourage your child to play with their food! They can build a mountain out of their mashed potatoes or a veggie train out of their peas and carrots, and then have fun eating them up!